An antidote to the West's dysfunctional spin on Islam. (Morning Star News) – Few people realize that we are today living through the largest persecution of Christians in history, worse even than the famous attacks under ancient Roman emperors like Diocletian and Nero. Estimates of the numbers of Christians under assault range from 100 million to 200 million. According to one estimate, a Christian is martyred every five minutes. And most of this persecution is taking place at the hands of Muslims. Of the top 50 countries persecuting Christians, 42 have either a Muslim majority or have sizeable Muslim populations. 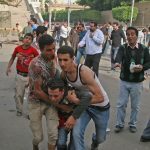 The extent of this disaster, its origins, and the reasons why it has been met with a shrug by most of the Western media are the topics of Raymond Ibrahim’s “Crucified Again.” Ibrahim is a Shillman Fellow at the David Horowitz Freedom Center and an associate fellow of the Middle East Forum. Fluent in Arabic, he has been tracking what he calls “one of the most dramatic stories” of our time in the reports and witnesses that appear in Arabic newspapers, news shows, and Websites, but that rarely get translated into English or picked up by the Western press. What he documents in this meticulously researched and clearly argued book is a human rights disaster of monumental proportions. In “Crucified Again,” Ibrahim performs two invaluable functions for educating people about the new “Great Persecution,” to use the label of the Roman war against Christians. First, he documents hundreds of specific examples from across the Muslim world. By doing so, he shows the extent of the persecution and forestalls any claims that it is a marginal problem. Additionally, Ibrahim commemorates the forgotten victims, refusing to allow their suffering to be lost because of the indifference or inattention of the media and government officials. Second, he provides a cogent explanation for why these attacks are concentrated in Muslim nations. In doing so, he corrects the delusional wishful thinking and apologetic spin that mars much of the current discussion of Islamic-inspired violence. Ibrahim’s copious reports of violence against Christians range across the whole Muslim world, including countries such as Indonesia, which is frequently characterized as “moderate” and “tolerant.” Such attacks are so frequent because they result not just from the jihadists that some Westerners dismiss as “extremists,” but from mobs of ordinary people, and from government policy and laws that discriminate against Christians. Rather than ad hoc reactions to local grievances, then, these attacks reveal a consistent ideology of hatred and contempt that transcends national, geographical, and ethnic differences. In Afghanistan, for example, where American blood and treasure liberated Afghans from murderous fanatics, a court order in March 2010 led to the destruction of the last Christian church in that country. In Iraq, also free because of America’s sacrifice, half of the Christians have fled; in 2010, Our Lady of Salvation Church in Baghdad was bombed during mass, with 58 killed and hundreds wounded. In Kuwait, likewise, the beneficiary of American power, the Kuwait City Municipal Council rejected a permit for building a Greek Catholic church. A few years later, a member of parliament said he would submit a law to prohibit all church construction. A delegation of Kuwaitis was then sent to Saudi Arabia – which legally prohibits any Christian worship – to consult with the Grand Mufti, the highest authority on Islamic law in the birthplace of Islam, the Arabian Peninsula. The Mufti announced that it is “necessary to destroy all the churches of the region,” a statement ignored in the West until Ibrahim reported it. Imagine the media’s vehement outrage and condemnation if the Pope in Rome had called for the destruction of all the mosques in Italy. The absence of any Western condemnation or even reaction to the Mufti’s statement was stunning. Is there no limit to our tolerance of Islam? 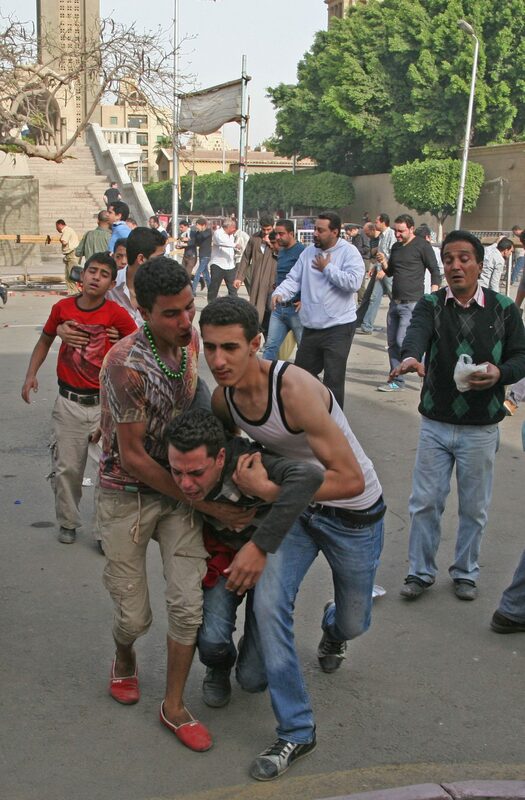 The destruction of St. George’s precipitated a Christian protest against government-sanctioned violence against Christians and their churches in the Cairo suburb of Maspero in October 2011. As Muslim mobs attacked the demonstrators to shouts of “Allahu Akbar” and “kill the infidels,” the soldiers sent to keep order helped the attackers. Snipers fired on demonstrators, and armored vehicles ran over several. Despite the gruesome photographs showing the crushed heads of Copts, the Egyptian military denied the charges but then claimed that Copts had hijacked the vehicles and ran over their co-religionists. The scope of such persecution, the similarity of the attacks, and the attackers’ motives, despite national and ethnic differences, and the role of government officials in abetting them, all cry out for explanation. Ibrahim clearly lays out the historical and theological roots of Muslim intolerance in the book’s most important chapter, “Lost History.” Contrary to the apologists who attribute these attacks to poverty, political oppression, the legacy of colonialism, or the unresolved Israeli-Arab conflict, Ibrahim shows that intolerance of other religions and the use of violence against them reflects traditional Islamic theology and jurisprudence. First Ibrahim corrects a misconception of history that has abetted this misunderstanding. During the European colonial presence in the Middle East, oppression of Christians and other religious minorities was proscribed. This was also the period in which many Muslims, recognizing how much more powerful the Europeans were than they, began to emulate the political and social mores and institutions of the colonial powers. Thus they abolished the discriminatory sharia laws that set out how “dhimmis,” the Christians and Jews living under Muslim authority, were to be treated. In 1856, for example, the Ottomans under pressure from the European powers issued a decree that said non-Muslims should be treated equally and guaranteed freedom of worship. This roughly century-long period of relative tolerance Ibrahim calls the Christian “Golden Age” in the Middle East. Unfortunately, as Ibrahim writes, the century-long flourishing of Middle Eastern Christians “has created chronological confusions and intellectual pitfalls for Westerners” who take the “hundred-year lull in persecution” as the norm. In fact, that century was an anomaly, and after World War I, traditional Islamic attitudes and doctrines began to reassert themselves, a movement that accelerated in the 1970s. The result is the disappearance of Christianity in the land of its birth. In 1900, 20 percent of the Middle East was Christian. Today, less than 2 percent is. Having corrected our distorted historical perspective, Ibrahim then lays out the justifying doctrines of Islam that have made such persecution possible during the 14 centuries of Muslim encounters with non-Muslims. The foundations can be found in the Koran, which Muslims take to be the words of God. There “infidels” are defined as “they who say Allah is one of three” or “Allah is the Christ, [Jesus] son of Mary” – that is, explicitly Christian. As such, according to the Koran, they must be eliminated or subjugated. The most significant verse that guides Muslim treatment of Christians and Jews commands Muslims to wage war against infidels until they are conquered, pay tribute, and acknowledge their humiliation and submission. In the seventh century, the second Caliph, Omar bin al-Khattab, promulgated the “Conditions of Omar” that specified in more detail how Christians should be treated. These conditions proscribe building churches or repairing existing ones, performing religious processions in public, exhibiting crosses, praying near Muslims, proselytizing, and preventing conversion to Islam, in addition to rules governing how Christians dress, comport themselves, and treat Muslims. “If they refuse this,” Omar said, “it is the sword without leniency.” These rules have consistently determined treatment of Christians for 14 centuries, and Muslims regularly cite violations of these rules as the justifying motives for their attacks. As a Saudi Sheikh said recently in a mosque sermon, “If they [Christians] violate these conditions, they have no protection.” From Morocco to Indonesia, Christians are attacked and murdered because they allegedly have tried to renovate a church, proselytized among Muslims, or blasphemed against Mohammed – all reasons consistent with Koranic injunctions codified in laws and the curricula of school textbooks. Both Islamic doctrine and history show the continuity of motive behind today’s persecution of Christians. As Ibrahim writes, “The same exact patterns of persecution are evident from one end of the Islamic world to the other – in lands that do not share the same language, race, or culture – that share only Islam.” But received wisdom in the West today denies this obvious truth. The reasons for this attitude of denial would fill another book. As Ibrahim points out, the corruption of history in the academy and in elementary school textbooks have replaced historical truth with various melodramas in which Western colonialists and imperialists have oppressed Muslims. These and other prejudices have led American media outlets to ignore or distort Islamic-inspired violence, as can be seen in the coverage of the Nigerian jihadist movement Boko Haram. These jihadists have publicly announced their aim of cleansing Nigeria of Christians and establishing sharia law, yet Western media coverage consistently ignores this aim and casts the conflict as a “cycle of violence” in which both sides are equally guilty. Within the global Muslim community, there is a civil war between those who want to adapt their faith to the modern world, and those who want to wage war in order to recreate a lost past of Muslim dominance. We do the former no favor by indulging Islam’s more unsavory aspects, since those aspects are exactly what need to be changed if Muslims want to enjoy the freedom and prosperity that come from political orders founded on human rights and inclusive tolerance. Raymond Ibrahim’s “Crucified Again” is an invaluable resource for telling the truth that could promote such change. Bruce S. Thornton is a Research Fellow at the Hoover Institution and W. Glenn Campbell and Rita Ricardo-Campbell National Fellow (2009–10, 2010–11). Reprinted from “Defining Ideas” with the permission of the publisher, the Hoover Institution. Copyright © 2013 the Board of Trustees of Leland Stanford Junior University. Non-Christians like the Muslims and Hindus living in the Christian countries have all the freedom to worship their God and to build houses of worship. The Christian religion is the majority religion of the world, almost 33% of the world population. The Catholic Church alone is over 1.2 billion people. It is very sad and terrible to read that the Christians are persecuted in many countries like the Islamic countries. The rulers of those countries must see the freedom their citizens are enjoying in the Christians countries, and reciprocate as a simple courtesy. On the other hand, read what Koran is telling about JESUS, His virgin birth, as the only person filled with the Holy Spirit. The Christians are following that GOD.